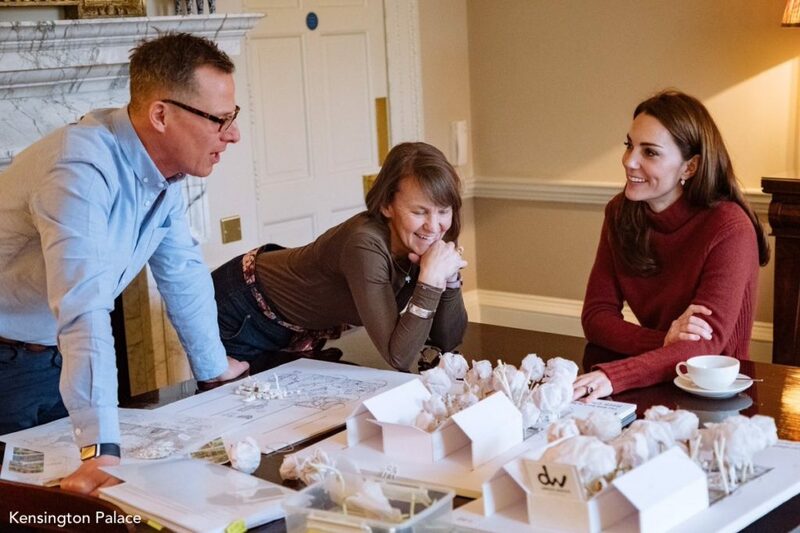 The Duchess has been working with Andrée Davies and Adam White (of Davies White Landscape Architects) on the plans, in partnership with the Royal Horticultural Society. 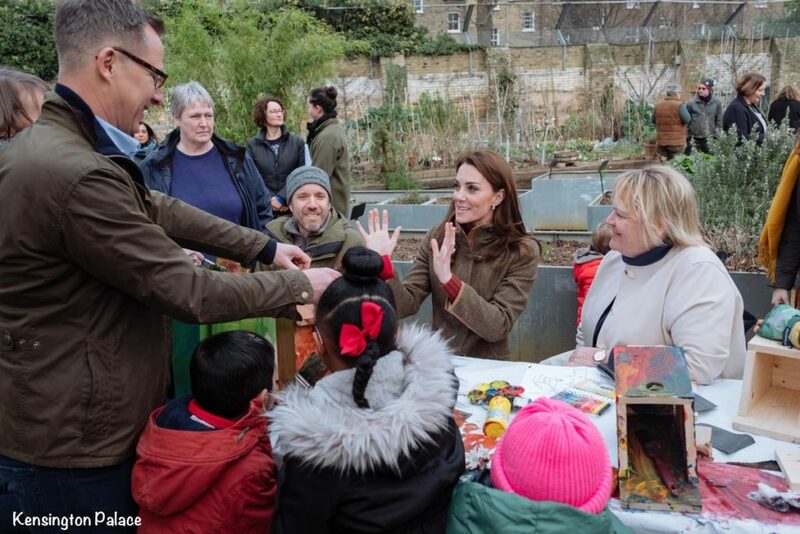 You may recall mention of the project when the Duchess visited King Henry’s Walk last month. 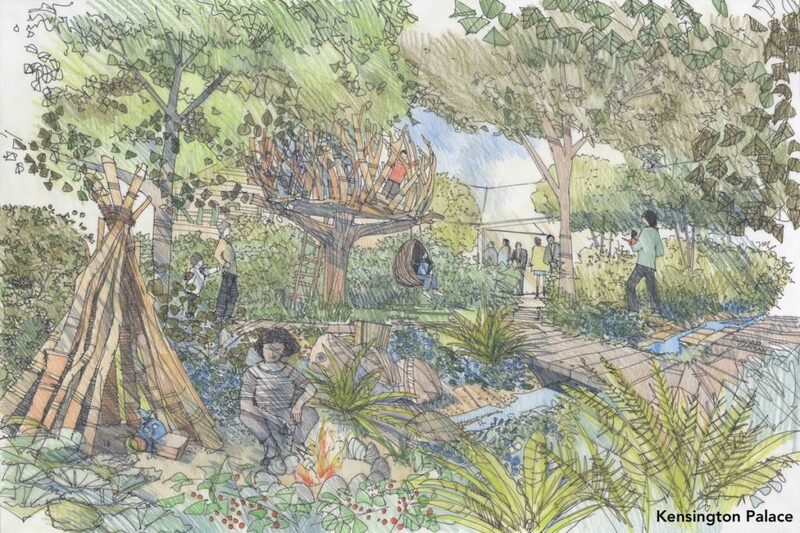 Called the RHS Back to Nature Garden, it is hoped the project will showcase the benefits of the natural world and trigger memories of times people have spent in nature, encouraging others to go out and create new experiences in the great outdoors. The garden’s centrepiece will be a high platform tree house, clad in stag horn oak that is inspired by a bird or animal nest. It will provide a wonderful place to retreat and look out through the trees. The garden will also feature a swing seat, rustic den and a campfire to encourage creative play and discovery for all generations. 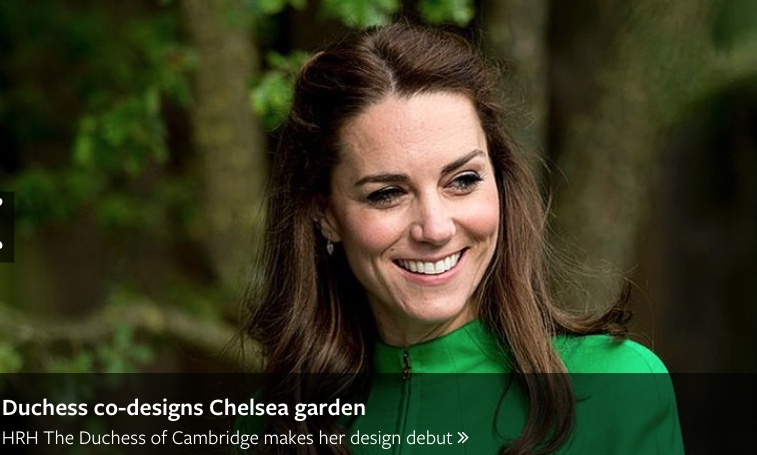 The RHS is delighted with the duchess’s involvement. Sue Biggs, RHS Director General, said in January the organization was “thrilled” at the prospect. The Back to Nature Garden is also key to the Horticultural Society’s partnership with NHS (National Health Service), promoting the many benefits of access to green spaces and gardening. After Chelsea, some of the planting and landscaping will go to an NHS Mental Health Trust, as part of a national competition run by the RHS. This isn’t the only garden Kate is co-designing with Davies White; two additional RHS Gardens will be created at RHS Hampton Court Palace Garden Festival (2-7 July 2019) and RHS Garden Wisley in Surrey, opening later this year in the autumn. Both will use many of the elements from the Chelsea Garden. Our look at what Kate wore is very quick, as we’ve seen almost everything she is wearing. In several photos, she is in the same ensemble worn to the King Henry’s Walk engagement. That included the Bracken Tweed jacket by Dubarry. 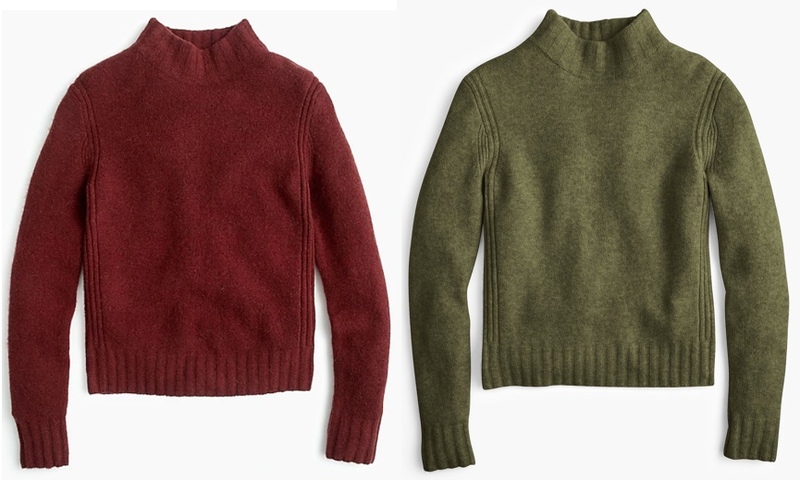 Most of the images show Kate wearing the Mockneck Sweater in Supersoft Yarn ($79.50) in ‘mahogany’ from J Crew, also seen at the January engagement. But she’s not wearing the mahogany sweater in all of the photos, as Laura pointed out on Twitter; in some pictures, the Duchess appears to be wearing the same sweater in the Loden Green colorway. We don’t see Kate’s feet in any of the new images released today; in January she sported a pair of boots from See by Chloé in dark suede with leather trim. The style features an oversized back pull loop, reinforced eyelets, treaded rubber sole, and a distinctive stacked 1.5″ heel. 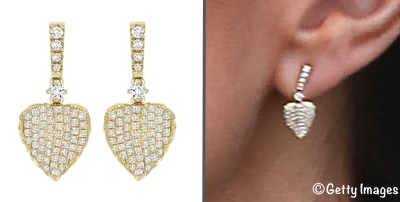 In most of the photos, Kate is wearing the Lauren Pavé Leaf earrings by Kiki McDonough. It will be fun to see this all come together. This year’s show runs from May 21-25. The image below is from the home page of the Royal Horticultural Society. I just want to let you know I don’t see any new pictures of Kate with this post, just the one from the King Henry’s Walk engagement. I thought it was an issue with my iPad and figured I’d give it a try using my desktop computer at work, but I’m having the same problem. Lovely casual look and I don’t understand how she can wear a sweater under a close fitting jacket and look so streamlined. I would look lumpy and bumpy. It has been said many times, but I do think this country casual, working out in the garden look is Kate in her natural element and preferred surroundings. I spy a lot of fun nooks and crannies in the artist’s rendering of Kate and the landscape architect’s design. Always love a water feature and the shelter, perhaps made of tree limbs, is one that I can see adaptable to other natural materials. The fire pit, rimmed with stones, will be a hit with children and adults alike and I’m sure will motivate many to go outdoors and incorporate some of these ideas. Can’t wait to see this garden realized in May! It’s also great to have more detail on the show garden she is working on, it’s always extraordinary how much is crammed in to each of the entries every year. 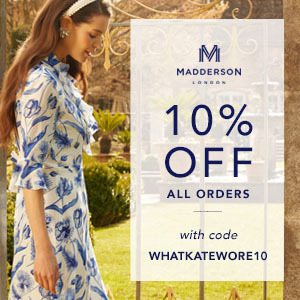 Kate’s one looks a great deal of fun for all ages and she seems to have no end of experts around her to help turn her ideas into a presentable whole. Have just ordered my J Crew jumper in mahogany, I missed out last time when they all got snapped up fast! 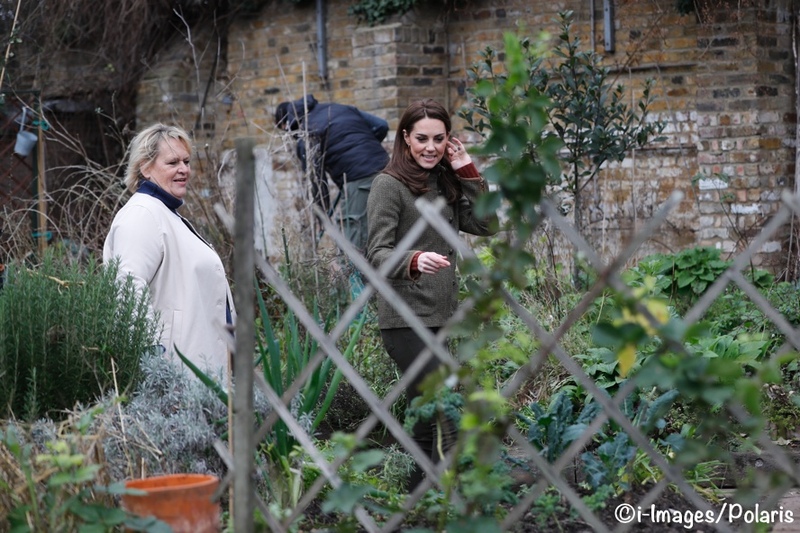 I cant wait to see Kate’s garden brought to life. It looks like its going to be a creative and beautiful space. It seems like shes put alot of thought into its design and considered how the kids play outside and how they connect with nature as well as make it a pretty space. I find that Kate always looks her best in fall colours like this. She looks happy, relaxed, and just beautiful. The garden is gorgeous. Kate always seems very private, so getting a little glimpse of what she likes Is great. Her kids seem to have a very normal childhood — cooking with their mom, climbing trees, etc. Love her casual pieces. Love this post! !